Over the recent years, I’ve noticed that many of us — by us, I mean those who are intimately involved in drum and bugle corps — have resorted to calling the activity “band” or “marching band.” I get it. At first, it was a funny and silly. The world champion Carolina Crown ran with it with their “purple pants band” meme in 2013. We were calling it band because we recognized the absurdity of the activity. If we reduced and rationalized the activity to its essence, then yes, it’s marching band. We chuckled at ourselves for working tirelessly for something that’s just…well…band. But by giving up on calling it drum corps, we’ve also given up on distinguishing it as an incredibly unique and different experience from all the other “band” activities. Calling it band is a discredit to ourselves and the work that we have done and continually do. I know. It’s hard work to explain drum corps to the uninitiated. As much as we explain it, it always feels they don’t get the gravity of the activity, especially when we use superficial analogies. So what are we supposed to say about drum corps that doesn’t elicit confusion and wandering eyes? How can we avoid resorting to the “b-word?” Rather than describing the activity and the product on the field, which can never be truly describable in words, we would be better off describing the feelings of the experience–from auditions to rehearsal to touring–and then performance. In describing the feelings, we answer both the why and the what. We describe values that are universally resonant, such as camaraderie, teamwork, perseverance, passion, and adversity. This helps the uninitiated to move beyond the stereotypical paradigm of marching band. But describing the feelings also communicates the uniqueness of the activity. How your face light up when you speak about the drum corps experience should hopefully express that it’s a special experience that is shared only to a privileged few. It’s a brotherhood and sisterhood that comes together on Facebook during championship week and post pictures of themselves in uniform because we yearn to relive that camaraderie, teamwork, perseverance, passion, and adversity. It’s way more than just marching band. I’m happy that the spirit of the activity hasn’t changed. It’s still all about the members’ experiences and setting them up for successful performance in the face of logistical and environment challenges that touring holds. However, the product has changed and evolved. In recent years and recent weeks, it has evolved into something vastly different from the product I grew up to love in the late 90s and early 2000s. Frankly, I’m not excited about the product anymore. That was my Facebook status today and I feel my thoughts should be expanded. I’ve experienced the activity as a fan, a performer, an instructor, and as an administrator. 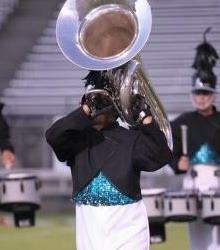 I marched in a World Class corps for four years as a contrabass/tuba player from 2002-2005. I then worked as a tour director and corps manager for the same corps from 2008-2013. I have a great appreciation for the history of the activity and its evolution from a small community activity in the 1950s to a national touring experience. As I said in my status, the spirit of the activity hasn’t changed a bit and I’m happy about that. The product and the experience of witnessing that product has regressed. Now I’m not saying today’s shows are awful. It’s impressive to see the technical excellence and clarity that many corps possess. But they lack the exciting spectacle of shows of previous decades. I fell in love with the activity as a fan for three reasons: 1) it was an exciting spectacle; 2) it was face-melting loud; and 3) it was technically spectacular compared to HS and college marching bands. There isn’t a single reason why shows have regressed. While many drum corps enthusiasts bemoan the recent controversial rule change allowing any brass instrument in performances, it’s only one of several reasons why this activity has lost the excitement and lure. Lazy design solutions: All the instrumental rule changes–the B-flat brass, electronics, synthesizers, amplification, any brass–were lazy solutions to a problem that already had answers. All these changes were approved by designers who believed that by adding these elements, it would make for a more accessible and entertaining product. I understand that builders want more tools in the toolbox. But these changes (expensive changes, as I like to add) were more for the designer than the fans. I don’t think fans ever asked for these changes. I’ve never said, “I would love this show even more if they played B-flat instruments/electronics/synthesizers/amps/sackbuts.” Designers demanded these changes because they wanted to make it easier for them to design shows that they thought would be better and more exciting. The result has been less focus on excitement and more energy devoted to novelty. The instrumental rule changes have little positive impact on entertainment: I’ve had the privilege of playing both G and B-flats in my time and a dinky G bugle was way louder and more fun to play. I remember vividly sitting in front of the 1999 Blue Devils brass line (their last year playing in G) during their encore at the Riverside show and not being able to hear my clapping during their tuning sequence because they were so loud. Granted, there have been some loud B-flat lines, but I vehemently believe they would’ve been louder with G horns. Compare the amplified trumpet solos from the recent Blue Devils and the unamped soprano solos of the 90s-era Madison Scouts and you know what I’m talking about. Likewise, the addition of synthesizers haven’t brought more exciting shows. They have primarily been utilized to augment the bass usually provided by the marching tubas (and as a tuba player, this upsets me). Unfortunately and tragically, the limitations of portable amplified speakers in a football stadium negate the overall potential impact of these expensive synths. Unless you’re sitting between the 40 yard lines (especially at Lucas Oil Stadium), it’s very difficult to hear the amplified voices and tones. That’s pretty much ignoring 40-50% of the fans. Indoor stadiums are awful, awful, awful venues: The last DCI championship I enjoyed was 2008 at the University of Indiana in Bloomington. Even sitting at the 20 yard line with other corps members and staff, I enjoyed the performances immensely. There’s something about the open-air environment that allows for a proper listening experience and a more lively crowd. I’ve attending championships in Orlando, Boston, Pasadena, and Denver. They all had more buzz in the crowd than Lucas Oil. Sitting at the 20 yard line at Lucas Oil is a depressing experience. There’s a detrimental lack of clarity and a lack of dynamic range in the closed-rood venue. The brass is muffled and the drums are static noise. During Carolina Crown’s show, I didn’t hear a single amplified voice from where I sat. Paralysis by analysis: Having been on the instructor/administrative side of the activity for several years, I’ve witnessed an egregious amount of overanalyzing by judges due to the judging system. There are unnecessary performance judges that observe every minute detail, that’s it maddening to instructors. Overanalyzing by the judges has led to an activity that’s so obsessed with clarity and technical excellence, it’s led to the discouragement (or even penalization) of risk-taking in designing shows. This is particularly pertinent to corps outside of the top 6. While corps like Blue Devils and Carolina Crown can (literally) afford to take risks in design, rising corps are so afraid of losing clarity points that they avoid challenging (and exciting) drill, music, and choreography. I’ve heard judges, especially field judges, overanalyzing everything from foot placement, horn snaps, tone from a single player, even the fit of the pants! This results in corps spending rehearsal time over the smallest aspects of the show that most spectators won’t even notice. Rather than challenging themselves with fast and breathtaking drill to end a show, corps water down the drill to make sure the performers have a better chance to play with good tone. The same applies to difficult musical passages. The absurdity of all this is that everything the judges say are NOT new to the instructors. The instructors know everything that needs to get better with their corps performance. It’s the fact that judges care and value these minute details pressure corps to sweat the small stuff. Brass arranger J.D. Shaw wrote a thorough opinion regarding the recent rule change (thanks to Ryan Turner for referring me to it). I’m a fan of Shaw’s arrangements with Phantom Regiment and Santa Clara Vanguard and he has a lot of good points, especially that the activity is always about the people in it, not the instruments. Shaw argues that we need to put faith in designers in incorporating these new instruments. As I said, it’s a lazy, misguided fix to an easy problem. If you think a trombone will make jazz repertoire more “effective,” you’re ignoring how exciting and loud the 1986 Blue Devils performed Channel One Suite with “just” baritones and euphoniums. I understand my criticism of today’s drum corps shows may be part of the “old fart” generational gap or that maybe the novelty of drum corps has worn off as I’ve aged. But my favorite shows are favorites for a lot of other fans, young and old. And I think what I like isn’t outdated. Loud, fast, exciting, suspenseful, risky, emotional, beautiful. I want these words to describe today’s shows. Unfortunately, as I sat in Lucas Oil Stadium this past August, I rarely used them.